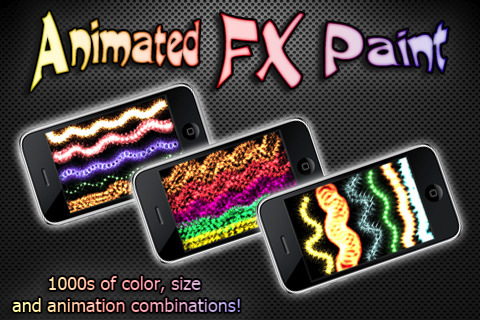 Animated FX Paint is a painting app that takes a vibrant approach to using an iPhone screen as a canvas. Like other painting or doodle apps, Animated FX Paint provides you with the tools to start creating a picture using your finger as a paintbrush, but it deviates in that the brushstrokes you produce are moving. It costs $0.99, was brought to us by Lowell Duke, and is compatible with an iPhone, iPod Touch, and iPad. 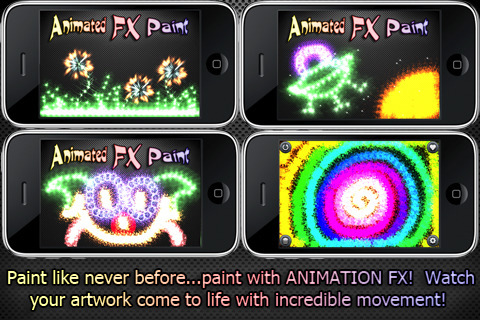 FX Paint takes you into the world of stick figures and smileys using a black screen and moving paint. In Settings, you find the options to tweak the paintbrush to the specific look you are going for. You can change the color, speed with which it moves, the animation mode, and size. The graphics or “Effects” you are given are reminiscent of the psychedelic computer screensavers from back in the day. There is the one that looks like a ball of fire, one that looks like a supernova, and others of the like. The spectrum of colors to choose from are set up as a bar that you can slide from side to side to choose the desired hue. If you make a mistake there is an undo button and if you get fed up with the direction that your drawing is going in you can clean the slate and start from scratch using the trashcan button. You can send any masterpiece you have created to a friend to make the person envious of your skill. The app also gives you the option to be humbled by truly great Animated FX Painters from around the world with a best of all time gallery. At first I was skeptical about the level of fun that this app would offer, but after spending some time playing with all of the features, I cannot stop drawing. I am using the app on my iPhone, which I have decided may not be as much fun as using it on an iPad. The limited and claustrophobic space on my screen does not allow for me to be able to draw much. AppSafari review of Animated FX Paint was written by Vanessa Paszterko on October 20th, 2010 and categorized under App Store, Art, Fun. Page viewed 4239 times, 1 so far today. Need help on using these apps? Please read the Help Page.